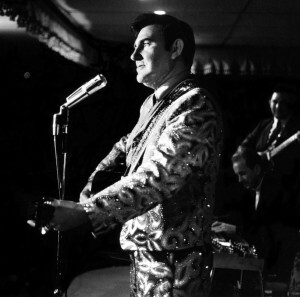 Webb Pierce singing at a club in Atlanta , GA in 1968. Webb Pierce remains one of the legends of country music and was one of the most popular honky tonk vocalists of the 1950’s, racking up more #1 hits than similar artists like Hank Williams, Eddy Arnold, Lefty Frizzell or Ernest Tubb. As a child in West Monroe, LA, Pierce became infatuated with Gene Autry films and his mother’s hillbilly records, particularly those of Jimmie Rodgers and various Western swing and Cajun groups. He began to play the guitar before he was a teenager. In late 1949, Webb accepted a spot on the Louisiana Hayride, a radio program on KWKH that was instrumental in launching the careers of many country artists. Webb began to assemble a band of local Shreveport musicians, which included recruiting pianist Floyd Cramer, guitarist/vocalist Faron Young, bassist Tillman Franks and vocalists Teddy and Doyle Wilburn. The Wilburns and Franks all wrote songs, which provided the basis for Webb’s initial set list. Webb’s second single, “Wondering” became his breakthrough hit, climbing to number one early in 1952. 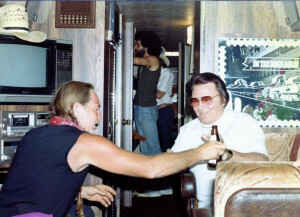 Webb Pierce and Willie Nelson sharing a cold one on Willie’s bus the “Honeysuckle Rose” during a stop in Nashville. Pictured in background is Willie’s harmonica player, Mickey Raphael. After the single became a hit, Pierce left Louisiana for Nashville, and had his second number one single with “That Heart Belongs to Me.” The following September, the Grand Ole Opry needed to fill the vacancy left by the firing of Hank Williams, so they invited Pierce to join the cast. After Williams’ death, Pierce became the most popular singer in country music. For the next four years, every single he released hit the Top Ten, with a total of ten reaching number one, including “There Stands the Glass” (1953), “Slowly” (1954), “More and More” (1954), and “In the Jailhouse Now” (1955). Pierce continued to have hits until the end of the ’50s primarily because he kept in close touch with DJs across the country allowing him to keep his streak of 34 consecutive Top Ten hits running into the year of1957. 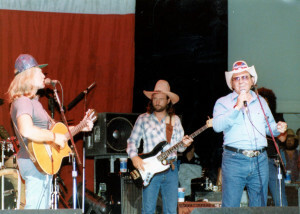 Webb Pierce joining Willie Nelson and band during the premier of Willie’s “Outlaw Channel” television network that originally aired from the Willie Nelson Museum in Nashville, TN. Throughout the 60’s and 70’s, Pierce continued to record, but most of his income came from his highly lucrative financial investments. Pierce left Decca Records in 1975, making a handful of records for Plantation Records that didn’t experience much chart success. His last hit came in 1982, when his duet on “In the Jailhouse Now” with Willie Nelson scraped the bottom of the country charts. Webb often stopped by the Willie Nelson store just to sit and talk with Frank and Jeanie Oakley. He always had his good friend along as well, Max Powell. It was never dull with the two of them around. Sadly, Webb Pierce died of pancreatic cancer in Nashville, Tennessee on February 24, 1991. In Webb’s honor, we’ve created a special display in the Willie Nelson museum dedicated to Webb Pierce. We also have a lot of photos of him scattered throughout the store and museum. So be sure and stop in – you’ll love it.